The new year’s Football Manager for Windows, Mac and Linux will launch comfortably in time for Christmas on November 7, Sports Interactive have announced. There’s a beta version available if you pre-order, and careers started there will carry over into the final game. This iteration features the most dramatically revamped Match View since the switch to 3D – achieved with a little help from the Sega Europe PC studio massive. 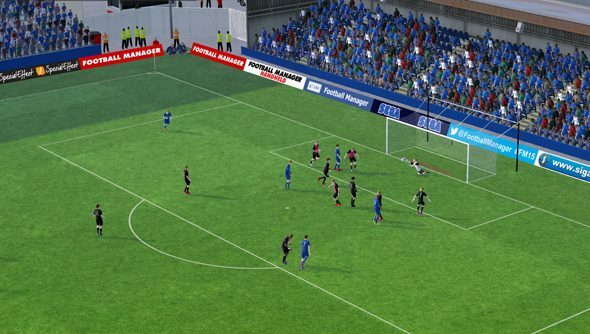 Sports Interactive say the Match View has enjoyed its biggest improvement since Football Manager 2009. That’s thanks in large part to motion capture work done at sister studio Creative Assembly. With the help of players from AFC Wimbledon, SI gleaned more than 2000 new animations from their time in the Total War mo-cap studio. Plenty else is new. Did you know, for instance, that FM now has a sort of class system? The game asks players to pick what sort of manager they intend to be before beginning the job. They can be a tactical manager, focusing on player recruitment, or maybe a ‘tracksuit’ manager, spending more time in the training ground. “Football management is a multi-faceted role nowadays and many of the new features in FM15 reflect this,” said SI boss Miles Jacobson. There’s full Twitch integration in Football Manager 2015, and the UI’s been given a good shake too – so there’ll be no mistaking this FM for its predecessors. Do you think you’ll give it a go?